(CNN) -- Premier League strugglers Middlesbrough suffered a further setback after admitting a charge of failing to control their players in a match against West Bromwich Albion last month. 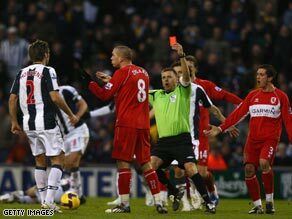 Referee Mark Halsey shows Didier Digard the red card in the January 17 game. Middlesbrough's players gathered around referee Mark Halsey after he sent off Didier Digard in the second half of the match at The Hawthorns on January 17. Visitors Boro eventually slumped to a 3-0 defeat to WBA, who are also in the bottom three and in a desperate battle to avoid relegation after being promoted last season. The defeat was part of a dismal run for Gareth Southgate's men who have not won for 12 games and now face further sanction from the Football Association after admitting the charge. A statement on the Football Association's Web site www.thefa.com read: "Middlesbrough have today admitted a charge of failing to control their players. "Middlesbrough have requested a personal hearing, which will be scheduled in due course." The charge adds to Boro manager Gareth Southgate's woes, with the club having dropped into the drop zone following a run of 12 league games without a win. Meanwhile, the FA also charged Manchester City winger Shaun Wright-Phillips with violent conduct after an incident between the 27-year-old and Stoke's Rory Delap during City's 1-0 defeat at the Britannia Stadium on Saturday. The incident involving the England international was missed at the time by referee Martin Atkinson. Wright-Phillips, who moved back to City from Chelsea earlier this season, has until Thursday evening to respond, but could face up to a three-game ban if he admits the charge.